Sunchokes are the sort of ingredient that I extol frequently and purchase rarely. I don’t have a very good excuse for this, except for the fact that sunchokes–also known as Jerusalem artichokes–tend to dwell in farmers’ markets and grocery stores for only a short period of time each year, usually in the spring. If you don’t catch them while they’re in season, you may easily go a long time without them. The last time I spotted sunchokes at my farmers’ market, I pointed them out to a friend. “Oooh,” she sighed. 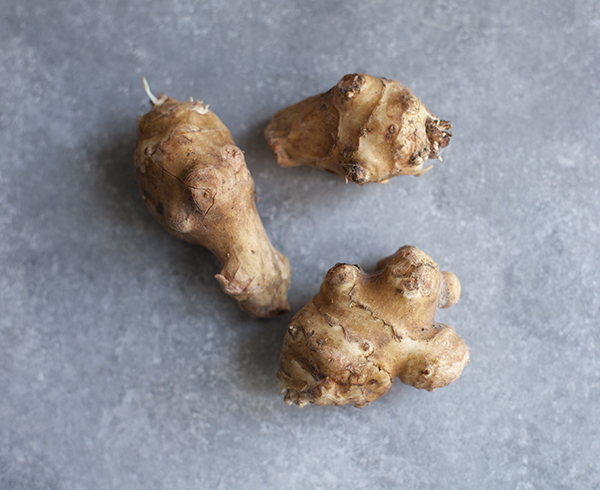 “Sunchokes.” Food lovers tend to feel strongly about these knobby vegetables, which sort of resemble a stouter version of ginger root. Once you develop a taste for them, it’s not hard to see why they inspire such affection. When you roast them, they crisp up like potatoes, but with a more delicate, less starchy texture. When you puree them, they become silky smooth and creamy. They can be mashed, sauteed, or–as you’ll see in this recipe–sliced thin and turned into chips. They’re versatile, and they’re fun. In addition to their culinary appeal, sunchokes have a number of noteworthy health properties. They’re very high in inulin, a type of carbohydrate that’s classified as a prebiotic. Prebiotics are impartially digested in the small intestine. When they pass on to the large intestine, they are partially fermented by gut microflora (1). Research suggests that, over time, they can encourage the growth of more beneficial bacterial species, like bifidobacterium (2, 3, 4). (Hope you don’t mind the references lately–I’m trying to get back into the habit!) 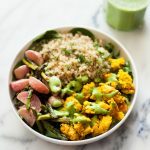 In addition to this, sunchokes are high in thiamine, which is essential for energy production and nervous system support, and potassium, which aids in electrolyte balance. I finally got my hands on a pound of sunchokes this past week, and it took me some time to figure out what to do with them. 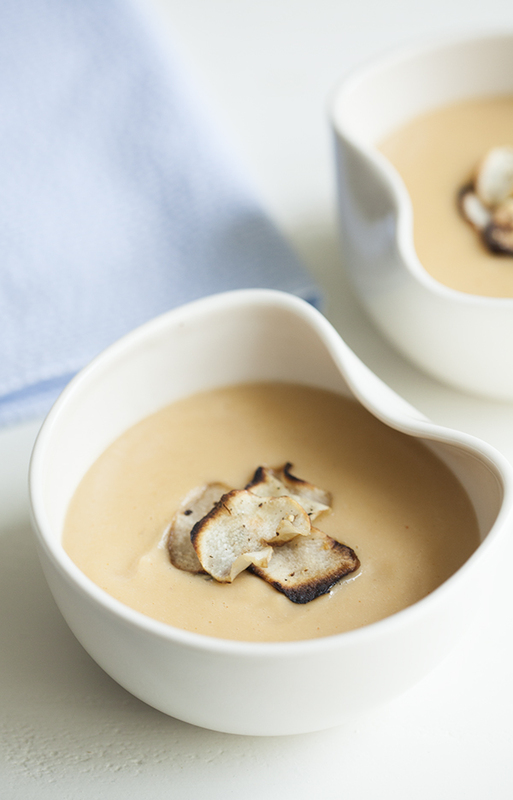 I decided to make a sunchoke and cauliflower soup, and I’m so glad I did. I’ve pureed and mashed sunchokes in the past, but this was my first time pureeing them into a spring soup. I love the sweetness that the sunchokes added to the pot (inulin can be converted to fructose over time, so sunchokes have some natural sweetness), and they paired so easily and naturally with cauliflower. I kept the seasoning simple here: just a whole lot of paprika. 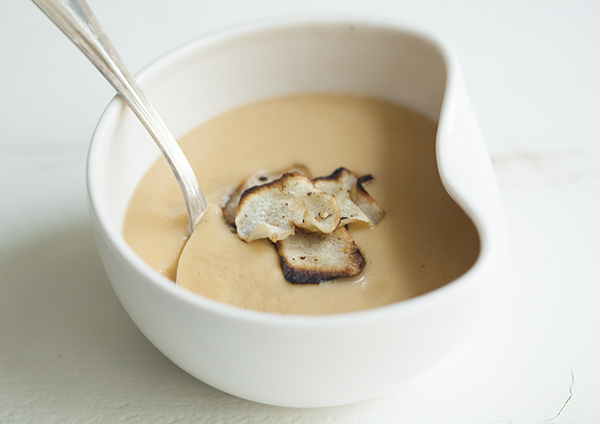 The smoked paprika is what creates the most flavor, but sweet paprika definitely plays a role in the soup, too. 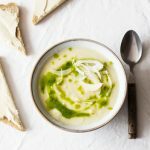 Personally, I find that sunchokes have a slightly smoky flavor on their own, so this soup highlighted a lot of what I love in the individual ingredients. It’s nice when a recipe does that. 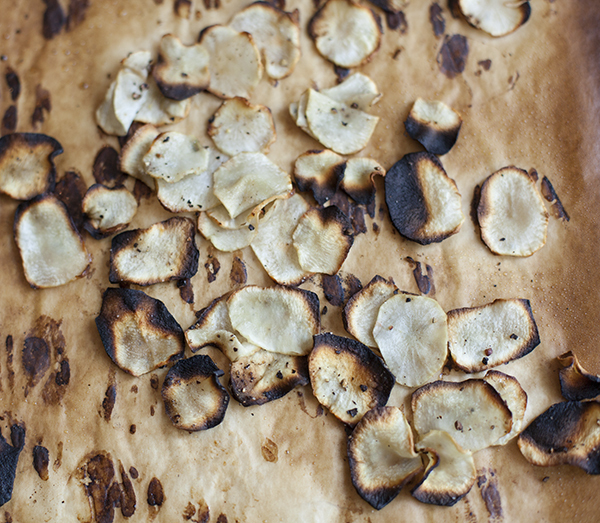 You certainly don’t have to make the sunchoke chips that the recipe calls for: really, they’re just for garnish. But once you have them, it’s hard not to appreciate how salty/sweet and tasty they are, or to nibble on them while you finish the soup off. If you'd like to make the sunchoke chip garnish, preheat your oven to 400. take your two reserved sunchokes and use a mandolin to slice them thinly (1/8 inch thick). Spread the chips on a parchment lined baking sheet and spray lightly with olive or coconut or grapeseed oil spray, if desired, and sprinkle with salt and pepper. Bake the chips for 15 minutes, or until crispy. Set them aside. Heat the olive oil in a large pot or Dutch oven over medium heat. Add the onion. Sauté the onion for 5 minutes, or until it's clear and soft. Add the garlic and cook for an additional minute, or until the garlic is fragrant. Add the salt, smoked paprika, sweet paprika, and harissa to the pot, and mix the spices into the onion/garlic mixture. Add the sunchokes and cauliflower to the pot, along with the vegetable broth and water. Raise the heat and bring the mixture to a boil. When it boils, lower it to a simmer and cover it. Simmer for 20 minutes, or until both the sunchokes and the cauliflower are tender. Transfer half of the soup to a blender and add half of the cashews. Blend the mixture till smooth, transfer it to another pot (or other container). Add the second half of the soup to the blender, along with the remaining cashews, and blend till smooth. Add this batch of soup to the first, and stir. 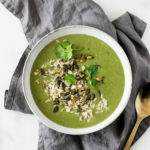 Season the soup to taste. Transfer the soup to serving bowls. 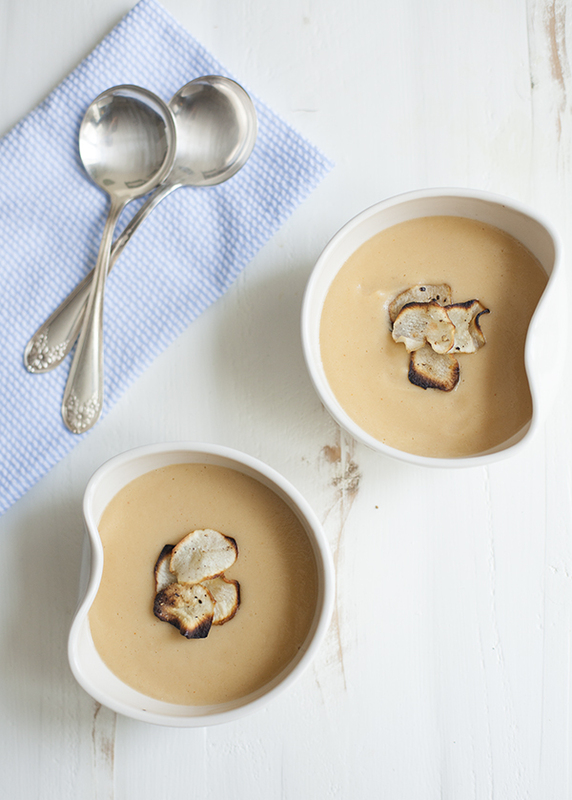 Top each with a small handful of sunchoke chips, and serve. 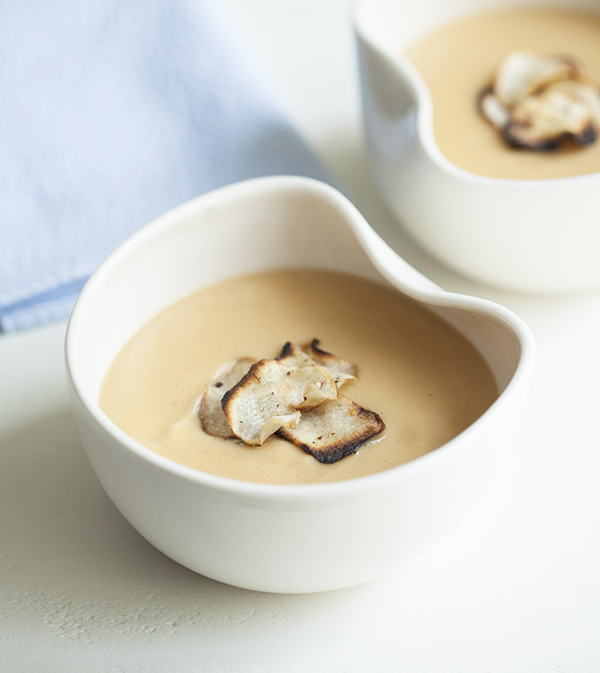 Stored in an airtight container in the fridge, the soup will keep for up to five days. I love that this soup only needs to simmer for twenty minutes. I love the hint of heat that harissa gives it. I love the smoky, sweet flavors. In short, I love this soup. I hope you’ll all love it as much as I do. If you’re not accustomed to working with sunchokes, perhaps this is the push you’ll need! And if you don’t have sunchokes, know that you could use potato as a good substitute; you’ll just end up with a slightly thicker soup. On that note, I’m wishing all of you a wonderful holiday weekend (or regular weekend). I’ll be back on Sunday with my weekend reading post, which I always look forward to assembling. 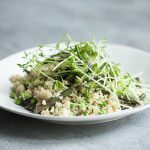 And on Monday, a post about culture–specifically, the practice of breaking bread in families or in groups–and how it intersects with the choice to be vegan. 1. Slavin, J. Fiber and prebiotics: mechanisms and health benefits. Nutrients. 2013 Apr; 5(4): 1417–1435. 3. Brownawell A.M., Caers W., Gibson G.R., Kendall C.W.C., Lewis K.D., Ringel Y., Slavin J.L. Prebiotics and the health benefits of fiber: Current regulatory status, future research, and goals. J. Nutr. 2012; 142:1–13. 4. Saavedra J.M., Tschernia A. Human studies with probiotics and prebiotics: Clinical implications.Br. J. Nutr. 2002; 87: S241–S246. Those sunchokes look amazing. Great recipe. I really appreciate all of your citations! As a woman of science, this is a big reason why I have followed your blog for so long (that, and every recipe I’ve made from your blog and book are fantastic!)! I can’t stand when people make outlandish claims and don’t back them up with evidence. So keep doing what you’re doing, I appreciate it! 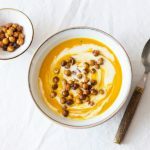 I like the Middle Eastern twist harissa paste gives to this soup – nice idea! I adore Jerusalem artichokes, they’re just such a faff to peel! My Mum gave me a bagful from her garden a month or so ago and they were delicious roasted up with some carrots and sweet potatoes. Your “chip” garnish looks lovely too. I’m new to eating sunchokes. I was daunted by to peel them. Then I read at http://www.thekitchn.com/try-this-roasted-sunchokes-105348 that the skin is edible. I need to research this further to see if there are any drawbacks to eating them unpeeled. The soup looks delicious. I love sunchokes (we call them Jerusalem artichokes) but I’m always out off by the peeling, did it take a long time…? I am sorry to say I have never heard of sunchokes before. I am not even sure if they have them in New Zealand, does anyone know? 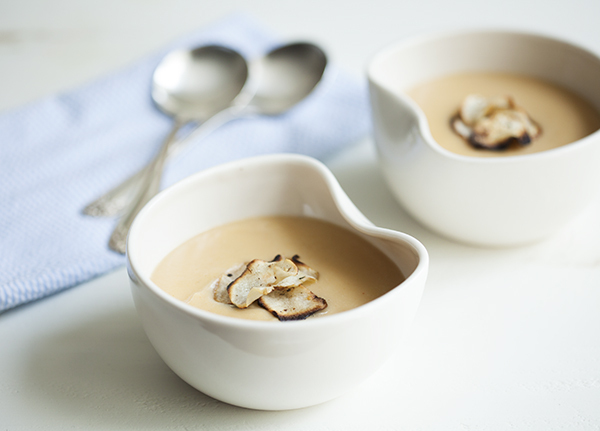 I love sunchoke soup, and this one looks so beautiful! ‘Ya know = I’m not sure I’ve come across these yet. I will have to try and look more carefully at my Farmer’s Market. They remind me of ginger (the look).